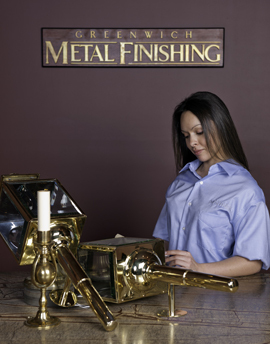 For almost 20 years homeowners, some of the most respected names in architecture, building, and design have turned to Greenwich Metal Finishing for all their metal refinishing, restoration, and fabrication needs. Our work on family heirlooms, crystal chandeliers, and metal furniture can be found in homes, corporate headquarters, historic buildings, public landmarks, and in the pages of leading magazines, including Martha Stewart Living, Architectural Digest, Home Décor, Interior Design and House Beautiful. We are an authorized Underwriters Laboratories (UL) marking and manufacturing facility, and meet the highest standards for ensuring the safe operation of chandeliers, table lamps, floor lamps, and sconces. Our facilities accommodate the full range of metal finishing services all under one roof. You can find us in Stamford, Connecticut conveniently off I-95. Pickup, delivery, and installation services are available within Fairfield, Westchester, and Putnam counties, New York City, Northern New Jersey, and Long Island. If you are outside our local area, we can arrange for professional crating and transportation. All work done by Greenwich Metal Finishing is insured against damage or loss, and each item is documented and identified upon receipt.